Hey so it’s been a while since I’ve written one of these but since I’m the only one out of us who got a Estrellas Orientales cap (seeing how they didn’t have the size for the other dude who normally writes these) I figured that I should write up a little something for it. 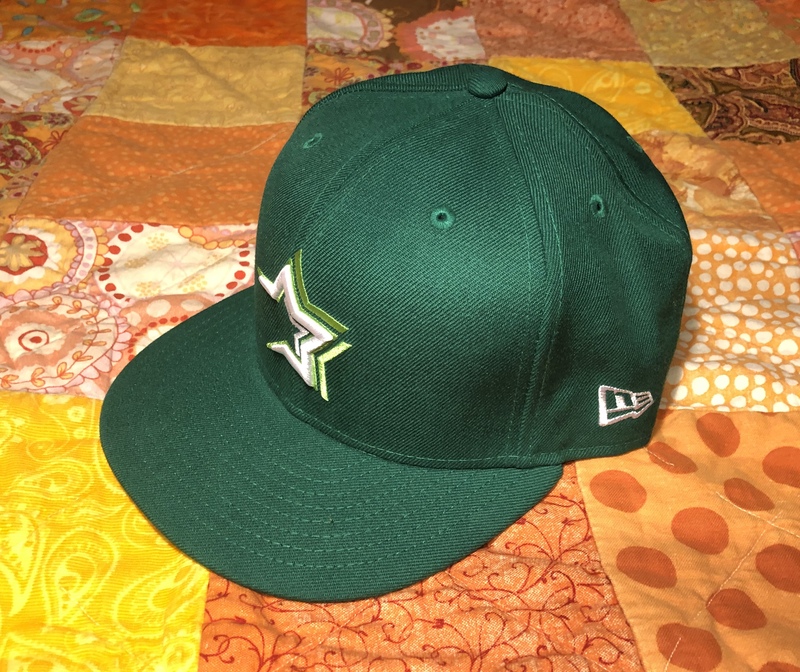 The cap is Kelly Green with a lime green and white star on the front. It’s 100% wool (made in China, for those who care) and it fits really comfortably, thankfully. I love the overall look of this one and it’s definitely one of my new favorites. In fact, I’m wearing it right now as I type this. Here’s a closer look of the main logo on the front. The lime green really makes it all pop against the darker Kelly green background of the hat. It also pairs nicely with the white of the star. As for the design of the star logo itself, it looks pretty similar to the 1994-2012 Astros logo (which I thought it was originally until I got a closer look). I do, however, like that they’ve got the lime green color radiating outwards to show that it’s “shining”. Now for the logo on the back. Contrary to how it may look, that actually says “LIDOM” not “UDOM” like I thought…anyways it’s an acronym for Liga de Béisbol Profesional de le República Dominicana. I don’t really have anything else to say about this except that it’s an interesting logo featuring the Dominican Republic flag right there…um yeah, onto the last picture. And here we are at last to the most important part of the cap when it comes to actually wearing it around. The underbrim and sweatband colors. Thankfully they’re both black so there’s no worries about having to restrict how often you wear it out of fear of sweat stains being visible. I honestly don’t know why all caps don’t come like this. I know the MLB on-field caps do, but MLB has also started to return to using lighter colors for their underbrims and sweatbands (at least for the special event and Spring Training caps) and I just don’t get it. Okay so that’s all I’ve got to say about this one. I really like it a lot and if you do too and you’re wondering where you can get one for yourself, well you may be out of luck because they’re sold out at the moment. But you can check Peligrosportsnyc.com periodically to see when/if they’re restocked.